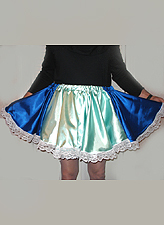 NEW DESIGN: the "TOPSY TURVY" SKIRT ! One way an "apron" effect, the other way a "skirt" effect. FABRIC CHOICE: recommended SATIN, but you can do TAFFETTA or cotton. Wear this skirt over your EXISTING MAID OUTFIT for a WHOLE NEW LOOK ! ~ TAFFETTA also available in a multitude of colors. JUST ASK ! SKIRT LENGTH in photo: 15 inches. but you can have it up to 18" for same price. GO MEASURE YOUR CRINOLINE ! Before ordering !